The legendary Manuel Barrueco is internationally recognized as one of the most important guitarists of our time. His unique artistry has been continually described as that of a superb instrumentalist and a superior and elegant musician, possessing a seductive sound and uncommon lyrical gifts. 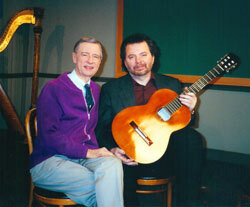 His career has been dedicated to bringing the guitar to the main musical centers of the world. During three decades of concertizing, he has performed across the United Sates from the New World Symphony in Miami to the Seattle Symphony, and from the Hollywood Bowl with the Los Angeles Philharmonic to New York’s Lincoln Center. He has appeared with such prestigious orchestras as the Philadelphia Orchestra and with the Boston Symphony under the direction of Seiji Ozawa, in the American premiere of ToruTakemitsu’s "To the Edge of Dream." In addition, he appears regularly with the Baltimore Symphony Orchestra and with San Francisco Performances. His international tours have taken him to some of the most important musical centers in the world. Highlights include the Royal Albert Hall in London, Musikverein in Vienna, Concertgebouw in Amsterdam, Philharmonie in Berlin, Teatro Real in Madrid, and Palau de la Musica in Barcelona. In Asia he has completed close to a dozen tours of Japan and made repeated appearances in Korea, Taiwan, Singapore, China, and Hong Kong. Barrueco’s tours of Latin America have included performances in Mexico, Brazil, Colombia, Costa Rica, and Puerto Rico. Barrueco's tours of Latin America have included performances in Mexico, Brazil, Columbia, Costa Rica, Panama, and Puerto Rico. He has also performed as a guest soloist with other international orchestras, such as the Russian State Symphony, Helsinki Philharmonic, Royal Philharmonic, NHK Symphony, New Japan Philharmonic, Auckland Symphony in New Zealand, Orquestra Sinfonica do Estado de Sao Paulo (OSESP), in Sao Paulo, Brazil, and the radio symphonies of Munich and Frankfurt. This coming season 2016-2017 includes solo recitals in the United States, Canada, Germany, Spain, and Italy, an appearance with the Puerto Rico Symphony and conductor Max Valdes, performances with the Cuarteto Casals in the United States, and the Beijing Guitar Duo in the United States and Europe. He will continue being an Artist-in-residence for the University of Alicante, Spain. In the 2017-2018 concert season, Mr. Barrueco will offer two solo tours in Europe in addition to a tour with the Cuarteto Latinoamericano as well as with the Beijing Guitar Duo. 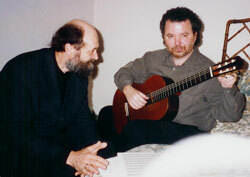 Barrueco's commitment to contemporary music and to the expansion of the guitar repertoire has led him to collaborations with many distinguished composers such as Steven Stucky, Michael Daugherty, Roberto Sierra, Arvo Pärt, Jonathan Leshnoff, Gabriela Lena Frank, Dmitri Yanov-Yanovsky, Jonathan Leshnof, and Toru Takemitsu, whose last orchestral work Spectral Canticle was a double concerto written specifically for Manuel Barrueco and violinist Frank Peter Zimmerman. Manuel Barrueco has appeared on a wide array of American television programs including "CBS Sunday Morning", A&E's "Breakfast with the Arts", and "Mister Rogers' Neighborhood" on PBS. His work in music also inspired Michael Lawrence’s biographical documentary: “Manuel Barrueco: A Gift and a Life” which has been aired by PBS stations around the United States including WNET-TV in New York. He was also featured in a Lexus car commercial. Barrueco’s performances have been broadcast by television stations around the world such as NHK in Japan, Bayerische Rundfunk in Germany, and RTVE in Spain. Barrueco’s recording catalogue includes over a dozen recordings for the EMI label. His recording of Joaquín Rodrigo's "Concierto de Aranjuez" with conductor and tenor Plácido Domingo and the Philharmonia Orchestra was cited as the best recording of that piece in Classic CD Magazine, while "¡Cuba!" was called "an extraordinary musical achievement" by the San Francisco Chronicle. "Nylon & Steel," a collection of duos with guitar greats Al Di Meola, Steve Morse (Deep Purple), and Andy Summers (The Police), demonstrates Barrueco's outstanding versatility and imaginative programming. His "Concierto Barroco," with the Orquesta Sinfónica de Galicia and conductor Víctor Pablo Pérez, received a Latin Grammy nomination for Best Classical Recording. This CD contains the world premiere recordings of new works for guitar and orchestra by Roberto Sierra and Arvo Pärt, as well as two guitar concertos by Antonio Vivaldi. Other recordings encompass many of the works from the Spanish and Latin American repertoire, as well as Bach and Mozart, Keith Jarrett and Chick Corea etcetera. He collaborated with soprano Barbara Hendricks and flutist Emmanuel Pahud in Cantos y Danzas, with The King’s Singers on a Strauss album, and with the London Symphony on Manuel Barrueco plays Lennon & McCartney. His early recordings, available on VOX, have become a classic amongst guitar recordings. In 2007 Manuel Barrueco received a Grammy nomination for the “Best Instrumental Soloist Performance” for his "Solo Piazzolla," which was the first recording to be released on the exclusive Manuel Barrueco Collection on Tonar Music. "Tango Sensations" and "Sounds of the Americas" came out subsequently in collaboration with the Cuarteto Latinoamericano, the latter received a Latin Grammy Award for “Inca Dances” by Gabriela Lena Frank for “Best Classical Contemporary Composition.” "Virtuoso Guitar Duos" was released in 2009 andincludes the most breathtaking guitar duos from the Spanish and Latin-American repertoire. In 2010 he released a solo recording, "Tárrega!," which includes works and arrangements of the Spanish composer Francisco Tárrega and which received a Latin Grammy nomination for “Best Classical Album.” His latest release "Chaconne–A Baroque Recital" came out in 2012. In 2013 Manuel Barrueco released "Medea," which includes Barrueco’s arrangement of the ballet by flamenco guitarist/composer Manolo Sanlúcar. Barrueco recorded the work with the Tenerife Symphony Orchestra and Víctor Pablo Pérez conducting. The recording received a Latin Grammy nomination for "Best Classical Album." His latest recording "China West," a recording of guitar trios in collaboration with his protégés, the Beijing Guitar Duo (Meng Su & Yameng Wang) came out in 2014. Manuel Barrueco began playing the guitar at the age of eight, and he attended the Esteban Salas Conservatory in his native Cuba. He immigrated with his family to the United States in 1967, as political refugees. Later, he completed his advanced studies at the Peabody Conservatory of Music, where he now shares his love for music with a small number of exceptionally gifted young guitarists from all over the world. Manuel Barrueco is the recipient of the United States Artist Fontanals Fellowship for Artistic Excellence.